Alan Dunbar will battle Austria’s Matthias Schwab for the British Amateur Championship at Royal Troon on Saturday. Photo Pat Cashman/www.gui.ieRathmore’s Alan Dunbar is hoping his patience will pay off when he faces 17-year old Austrian Matthias Schwab in the 36-hole final of the 117th Amateur Championship at Royal Troon on Saturday. The 22-year old Portrush native will certainly need it if he is to put potential appearances in this year’s Open Championship and next year’s Masters and US Open out of his mind. Dunbar is looking to become the ninth Irish champion and the seventh from the island to pull it off following wins for Jimmy Bruen (1946), Sam McCready (1949), Joe Carr (1953, ‘58, ‘60), Garth McGimpsey (1985), Michael Hoey (2001) and Brian McElhinney (2005). 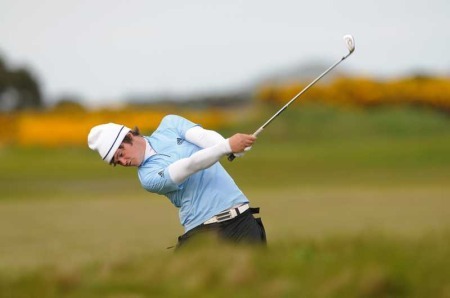 Dunbar is well used to performing pressure after producing two wins from his three matches for the winning Great Britain and Ireland Walker Cup side when considered a controversial pick by some sectors of the British media for last year’s win over the USA at Royal Aberdeen. In Friday’s semi-final he went out in three under 33 to to take a two hole lead over Ferrier and while he double bogeyed the 10th and 11th to go back to all square, he won the 12th with a birdie and 13th with a par to go two up again. Ferrier, who has just graduated from UNC Charlotte with a degree in psychology, was left to rue the bogey he made at the 15th to lose the hole after winning the 14th to get back to one down. Ferrier left Royal Troon with his head held high, despite not making the final. Dunbar could well be joining mentor Darren Clarke in the Open next month as well as next year’s US Open and Masters if he beats Schwab today. 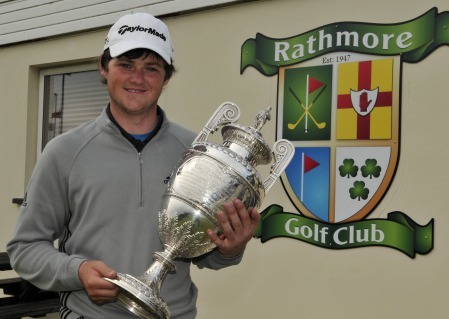 Not only is he a product of the Golfing Union of Ireland system, winning the St Andrews Links Trophy in 2009, he has also been helped by Darren Clarke Foundation and had the chance to play with Clarke at Royal Portrush in January. “He’s around a lot now that he lives back in Portrush so I see him a bit, and it was great to play with him,” said Dunbar, who revealed that he won money in a skins game involving the Open champion. Schwab ended the hopes of local Jack McDonald by two holes and can now become the first Austrian to win the title. He won the 2010 Austrian Amateur and has made the cut in the last two Austrian Opens on the European Tour. He faced a tight match against 19-year old McDonald from nearby Kilmarnock (Barassie), who had much of the support. McDonald was two down after 11 holes but fought back to square the match at the 15th. However, Schwab made a birdie on the par-5, 16thto go one up. The match ended when McDonald drove into the fairway bunker at the 18th and failed to make par. Schwab has also made a big step up this week. He has legendary German coach Willie Hoffman to thank. Hoffman coached Bernhard Langer to two Masters’ titles, and made him one of world’s best players. “I drive to Munich once every two months to see him, and the rest of the time I send him videos,” Schwab said. He made the cut on the mark of 145, 3-over-par, but has made the most of the match play stages. 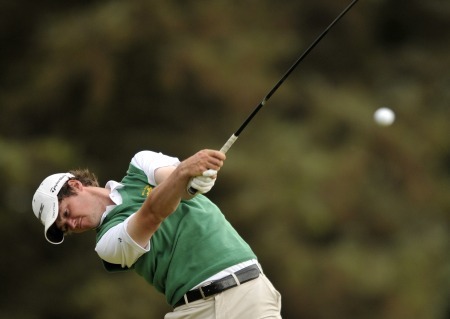 “There was a lot of nail biting about qualifying, so I was just happy to make it into the match play stages,” he said. Schwab comes from a sporting family. Father Andreas participated in the 1976 Winter Olympics at Innsbruck, and came fourth in the two-man Austrian Bobsleigh team. Matthias has a chance to get one over on Dad here at Royal Troon. Besides the Amateur Championship trophy, the winner gets a gold medal. Alan Dunbar, who will play in next week’s Irish Open, has reached the quarter-finals of the Amateur Championship at Royal Troon.Rathmore’s Alan Dunbar will face Sweden’s Robert Karlsson in today’s quarter-finals of the Amateur Championship at Royal Troon. Alan Dunbar was not at his best from tee to green but holed the putts when it counted. Rathmore’s Alan Dunbar pointed to his putting as the key to his one-hole win over Austria’s Matthias Schwab in the Amateur Championship at Royal Troon. A proud son of Rathmore. 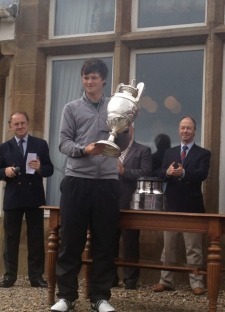 Alan Dunbar with the Amateur Championship trophy. Photo Pat Cashman/www.cashmanphotography.ieLocal hero Alan Dunbar insists he’s got nothing to lose at Royal Portrush after soaring to victory in the British Amateur. Alan Dunbar shot a brilliant, eight under 64 on Thursday. Picture: Pat CashmanAlan Dunbar blasted a course record equalling 64 to bounce back into contention for a unique double in the Chartis sponsored European Individual Amateur Championship at Carton House.